The post I put up yesterday has more extensive analysis of US AID praising of exit polling in 14 cases abroad - it is the test they use for the fairness of elections. 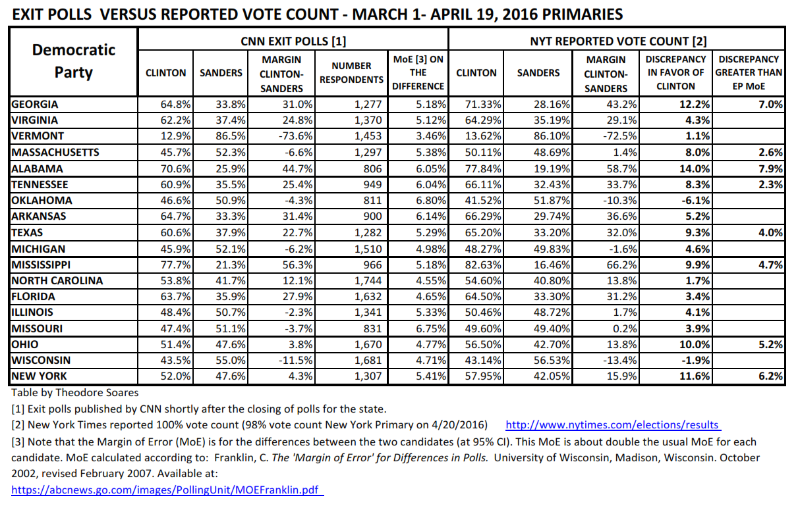 It also show the hidden reversal of what exit polling means - without commentary or as an unspoken assumption by the corporate media which all use the Edison group to do exit polling at primaries (I reprint some of the 2015 Edison Report to show this). Exit polling is the check on stolen elections, coming from talking to actual voters in multiple random samples as they leave the voting booth. What Edison does - in the United States, only - is to phony up so-called exit polls based on the reports of machines that leave no paper trail. That is, in a reversal, they use pseudo-polls to license theft (when the claimed result is way outside the Margin of Error as in New York below). The article below by Spencer Gundert adds further dimensions to the story and is worth reading. (h/t Paula Bard). Gundert, however, does not realize how extensively Republicans have used machine voting to falsify elections for the Presidency and very likely, for the Senate and House. The Democratic leadership has never protested (I, among many others, have spent a lot of time urging this from below in Colorado in 2004, and in 2012, about Ohio - fortunately, headed off by a campaign led by Jill Stein of the Green Party). The Clinton machine is thus part of high level "bipartisan" fraud over a period of time. And the claim that Hillary "doesn't get it" is belied by the fact that she was Secretary of State under Barack Obama, employing exit poll data to test the fairness of other countries' elections...Nonetheless, Gundert's article is important. The margin of error is designed to prevent this. When an exit poll or two is outside the margin of error, it denotes failure in the polling; when eight defy it — egregiously so — that indicates systemic electoral fraud. Thus, there’s a 99.9% probability that systemic electoral fraud was committed favoring Hillary Clinton. It demands an independent investigation, with the nomination results thoroughly, fairly, and properly audited. There wasn’t a single instance of voter suppression affecting a Hillary Clinton supporter. It solely affected Bernie Sanders. The likeliness of this not being electoral fraud is infinitesimally small. At the very least, it demands an independent investigation. 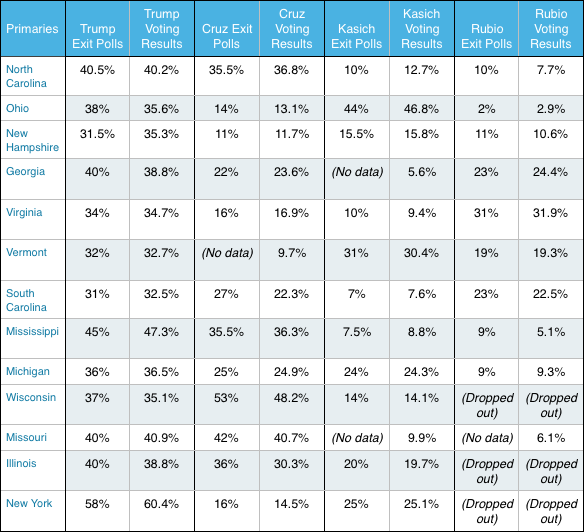 Fact 1: Polling places were closed in Arizona, New York, Rhode Island, and other voting locations. Fewer polling places leads to longer lines, and thus, voters get discouraged from voting when they otherwise would. This consistent, unusual closure hints at electoral fraud, since Bernie Sanders’s base (younger voters) votes later in the day because they have school, jobs, and generally more responsibilities. Clinton’s base consists of elderly voters, who are often retired, vote in by mail significantly more, and have more time throughout the day to vote; therefore, they don’t have to frequent long lines. One example is in Arizona, where some waited up to five and a half hours to vote. One voter professed that after waiting all that time, he couldn’t vote because his Democratic registration was changed. Furthermore, the media called the primary for Hillary Clinton with less than 1% of the votes reported, disregarding the extremely long lines of people still trying to vote. If you still believe, after reading all the aforementioned research, that electoral fraud could not possibly be committed favoring Hillary Clinton, keep this in mind. This is the politician who claimed, “I don’t believe I ever have [lied]. I don’t believe I ever will” and, “I’ve been the most transparent public official in modern times,” despite 13 minute YouTube compilations of her lying and 3 minute compilations of her laughing off difficult questions. This is the public official with a website clock dedicated to how long it’s taken her to “look into” releasing the transcripts of her paid speeches, and a picture timeline of her flip-flopping on 11 major issues. This is the former lawyer who claims to vouch for feminism and women’s rights, yet laughed on audio tape about a 12 year old being raped, after slandering her in trial to get her guilty defendant a lighter sentence. This is the Secretary of State whose State Department approved an excessive $165 billion in weapons sales to countries that donated money to the Clinton Foundation, including $29 billion of advanced fighter jets to Saudi Arabia. This is the Democrat whose super PAC is spending $1 million to “correct” Bernie Sanders supporters on social media. Yet, one of their former digital media specialists insists the campaign aims to depict Bernie and his supporters as sexist, racist, and unelectable, and falsify narratives of Clinton supporters as “victimized”. This is blatant information control and manipulation. 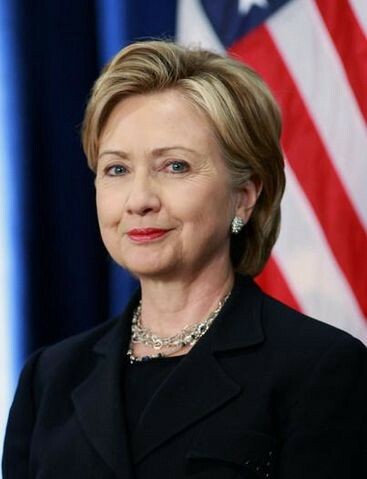 This is the candidate who hosted an unsecured, private email server at “clintonemail.com” as Secretary of State, exchanged at least 104 classified emails from the server, and then deleted around 30,000 emails once it was discovered. On March 10, 2015, she claimed the server “[contained] personal communications from my husband and me,” when six months later, Bill Clinton stated he’s only sent two emails in his life. Based on all this evidence, is it really a stretch that electoral fraud would be committed favoring her, when it is extremely easy to do so? Our democracy lives on transparency, fairness, and justice, and when our elections are blatantly corrupted and fraudulent, that democracy dies. We can either stay silent and watch our country disintegrate or stand up and fight for our rights. So, if you are disturbed by my findings, please share this as widely as you can and demand independent investigations into this fraud and our elections.